Losing weight is something that tends to be ever-present in our culture, especially among women. However, it is not always talked about or presented in a healthy way, even though it should be presented as a way to make your body healthier. 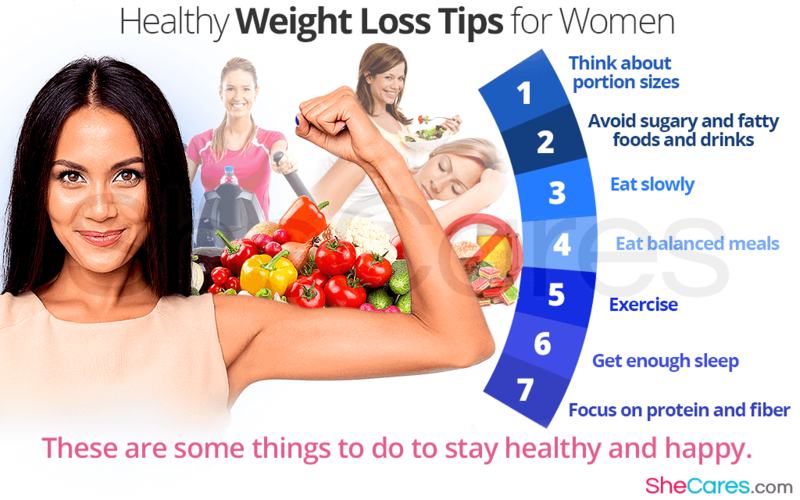 Here, we have some of the best weight loss tips to stay healthy and happy. In American especially, we're used to eating more food than we need because our portion sizes are so big. Start thinking about cutting down on how much food you put on your plate to help yourself eat the right amount of food you need instead of overindulging. Also consider if you're overeating because of an unrelated reason, like boredom or stress, and think about other ways to ameliorate that problem. Lots of the food we eat is full of ingredients that aren't so good for us. Trans fats, saturated fats, and added sugars are some of the most common and worst culprits. While you shouldn't cut fat out of your diet entirely, go for the healthy fats - like those found in nuts or avocados - rather than the unhealthy ones, and focus on sugars found from natural sources like fruits. Another reason, we tend to eat too much is that our stomachs can take a long time - up to 15 minutes - to signal the brain that it's full. This means that we might keep eating well past when we could stop. Eating slower gives your brain a chance to catch up with your stomach. Although this is a cliché, it's true. The best way to stay healthy and lose weight is to eat the foods with the right vitamins and minerals that your body needs, because having good general health can help your body lose weight. Exercise is a crucial part of a healthy lifestyle as well as an important tool to lose weight. You should get at least two and a half hours of exercise each week, which could be broken down into half an hour for five days each. Sleep is actually important for many different bodily functions, and studies have found that getting the recommended amount of sleep per night is associated with healthier body weights, so be sure to get all the Z's you need. Both protein and fiber are filling, which means that eating foods high in these ingredients can help you to feel fuller while eating fewer calories. As tempting as they may sounds, these types of diets almost never achieve their promised results, and they don't work in the long run. Even worse, they tend to be incredibly unhealthy and can actually cause more health problems for you. Although you should burn more calories than you consume to lose weight, overdoing it can be very dangerous. Additionally, skipping meals can make you more likely to overeat at your next meal, so you should always focus on eating the amount you need. With these weight loss tips, you'll be able to lose all your unwanted weight healthily in a way that will keep your body feeling great. To learn more about losing weight, read about the best diet for weight loss.